A little while back, when Autumn had just begun, we posted about the berry lip, which for the last few years has been a big trend in autumn/winter, read the post here. It makes such a great change to move forward from pretty pale pinks and nudes in summer, to a more vampy and bold colour in winter, that looks great with winter flushed skin and cosy coats. If you want to give the bold berry lip trend a go this year here’s your guide to creating the perfect lipstick look, that will last for hours, perfect for your next big event! 1. Buff your lips using a tooth brush, buy one specifically for this purpose as it’s great to keep your lips soft on a daily basis. Lightly buff the lips to remove dry skin. Now your lips will be even in texture and soft. 2. Use a lip primer that will make your colour last longer, or use a pale concealer as a base. By using a concealer this blocks out the natural colour of your lips meaning your colour will look bolder. Use a lip brush to get an even coverage of concealer. 1. 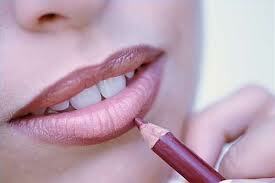 Take a lip liner as close in colour to your chosen shade of lipstick as possible. Start by lining the top lip, working along outer line of the lip, carefully lining the cupids bow. Next line the bottom of the lip, again lining along the outer line of the lip. 2. Next begin to fill in your lips with your chosen lipstick. Wind up the lipstick and take a clean lip brush, swirl it in the top of the lipstick so that the colour lightly coats the brush. Start to buff if into your top lip, being careful not to work outside of your lip liner. Do thesame on the bottom lip. 3. Blot the lips to remove excess colour. If you feel like you’d like your colour to be bolder, repeat the process again until you’re happy with your colour. Now you’ve perfectly applied your colour, next is to decide if you want to add any finishing touches. If you’d rather stick with a semi-matte look leave your lips as they are. If you’d like to add some shine for a more glamorous look there are two great options. For a low maintenance shine pat on a little Vaseline with your middle finger. For a stand out shine try a clear gloss, apply this with a lip brush so as to not use too much product. So now you know how to create an on trend lip look why not give it a go yourself. This trend suits most skin tones and is a great way to mix up your make-up look. With just a few make-up brushes, a berry lipstick and lip liner you can create a whole new look. Know someone who would love this post? Why not share it on social media!